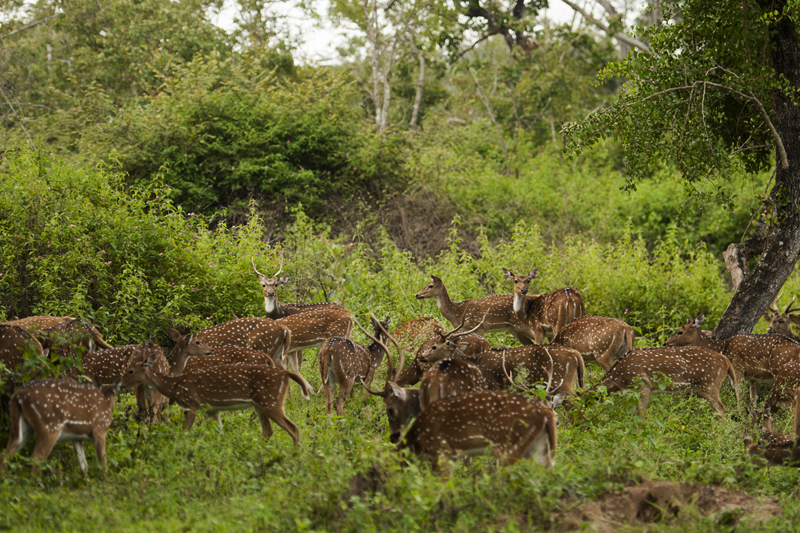 The fresh lush green forest cover and the high density of prey species in Bandipur National Park like Spotted Deer (above) and Gaur are an indicator of a good monsoon. We were positive that we would get to see one of the three predators; the Tiger, Leopard or the Wild Dog on this trip. In less than twenty minutes into the safari, we had the Wild Dog sighting and a little later in the same area of the forest we spotted a Leopard (below). Now you might ask where is the Leopard ? 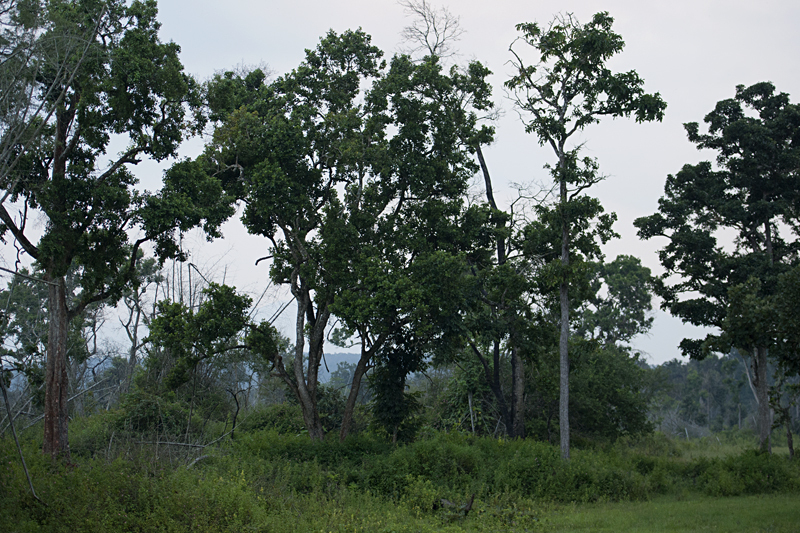 At 70mm focal length (above), it is literally impossible to spot the Leopard in this picture. So just imagine our plight trying to spot it with bare eyes at that distance. It took a couple of minutes of speculating – which tree and which branch it was on, to finally spot it. 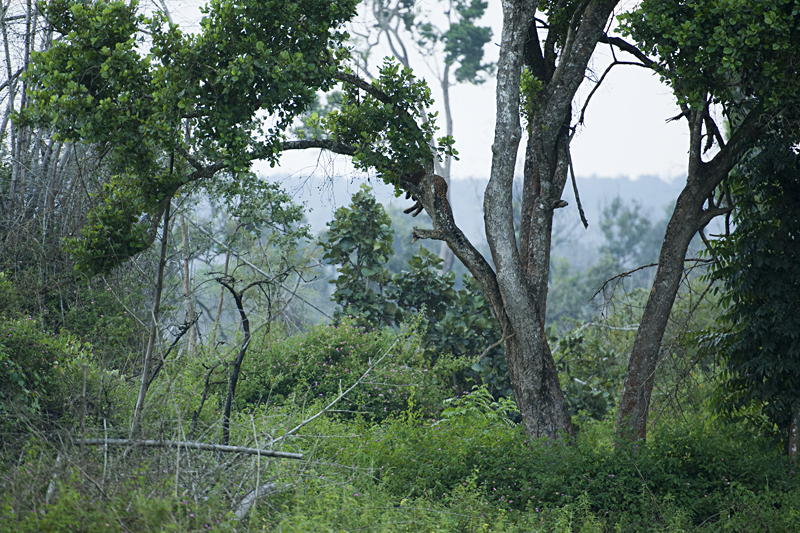 The Leopard was partially hidden, sitting in plain view on a low branch. It was barely visible even after zooming in to 200mm focal length (below). Such is the skillful camouflage of this elusive predator. I then switched to my trusted D300, 300mm f2.8 lens mounted with the 2x TC. And now at 600mm focal length, I could clearly see more of this male Leopard. However, from a photography standpoint, this is still an image for record purposes only. We waited to see if the Leopard would get down from the tree in an attempt to cross the road, thereby giving us an opportunity for better pictures. But the relaxing Leopard was in no mood to exert itself. 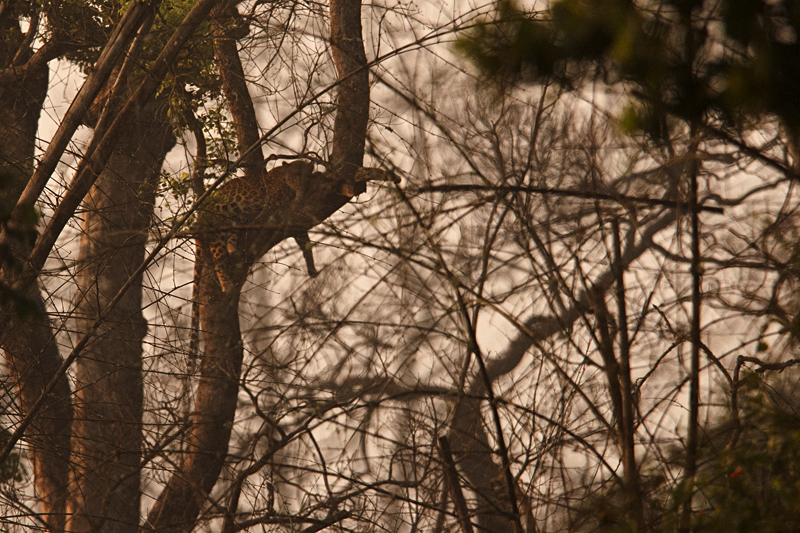 The next morning, we rushed to the same area and after frantic searching, we spotted a Leopard. This one too was relaxing on another tree that was still further away from the safari road. This picture (below) is all we could manage at 600mm focal length. 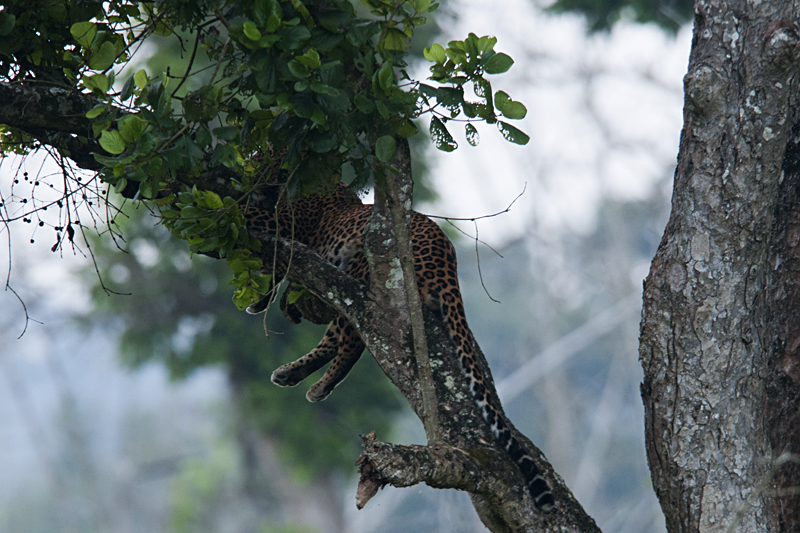 While we were keenly watching, another Leopard climbed down from a branch on the same tree. We were happy to see two Leopards together. Seldom does one get a chance like that. After a few minutes of watching them, we moved on hoping for some more luck in the safaris ahead.